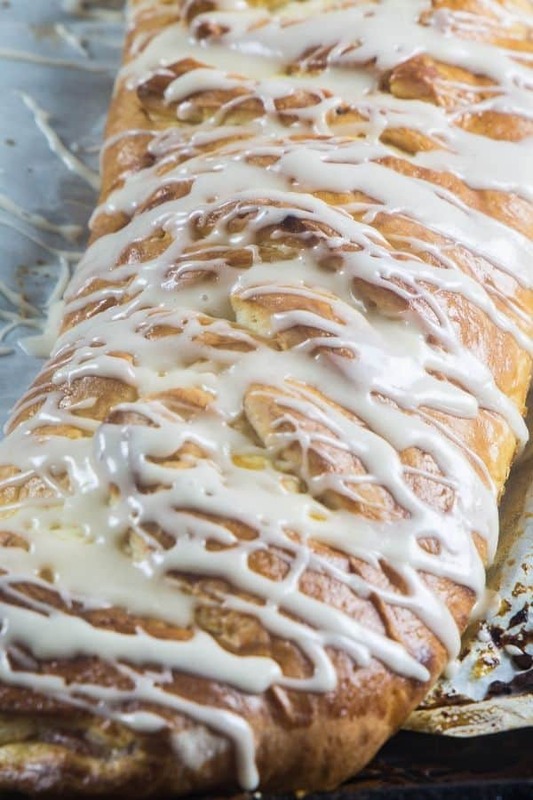 This yummy Cream Cheese Danish Recipe is a showstopper of deliciousness and no one will know how easy it was to make! A great sweet bread that explodes with flavor from raspberry jam and cream cheese! Use ready made dough cuts out so much time and prep work! Your family and friends will be so impressed and they will love your danish recipe! Rhodes Bake-N-Serv® is a new product for me! I have been loving using their rolls! They make amazing rolls, obviously! You guys,their rolls can make so much more! I have been experimenting with them for weeks! The family doesn’t want the experimenting to end! 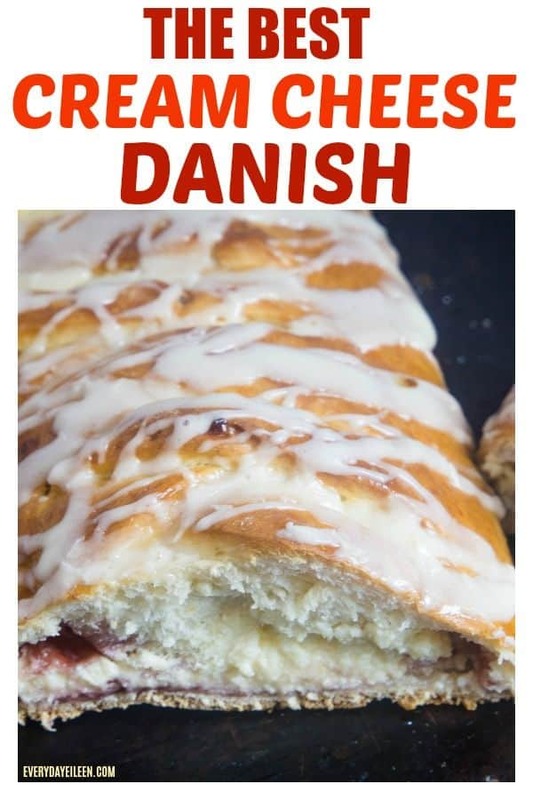 Whether you call this recipe a sweet bread or danish, justmake it my friends, it’s delicious! 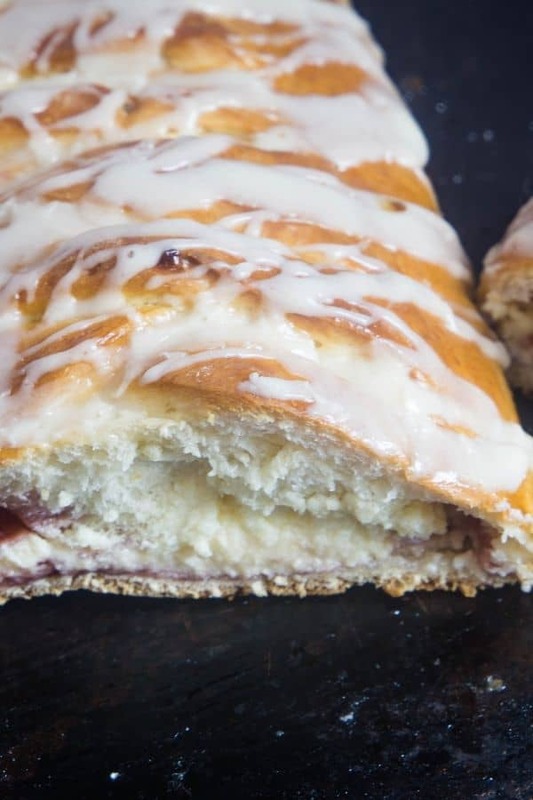 I really loved using Rhodes Bake-N-Serv® to make this Raspberry Cream Cheese Danish! Making Danish can be intimidating but they can be very easy! 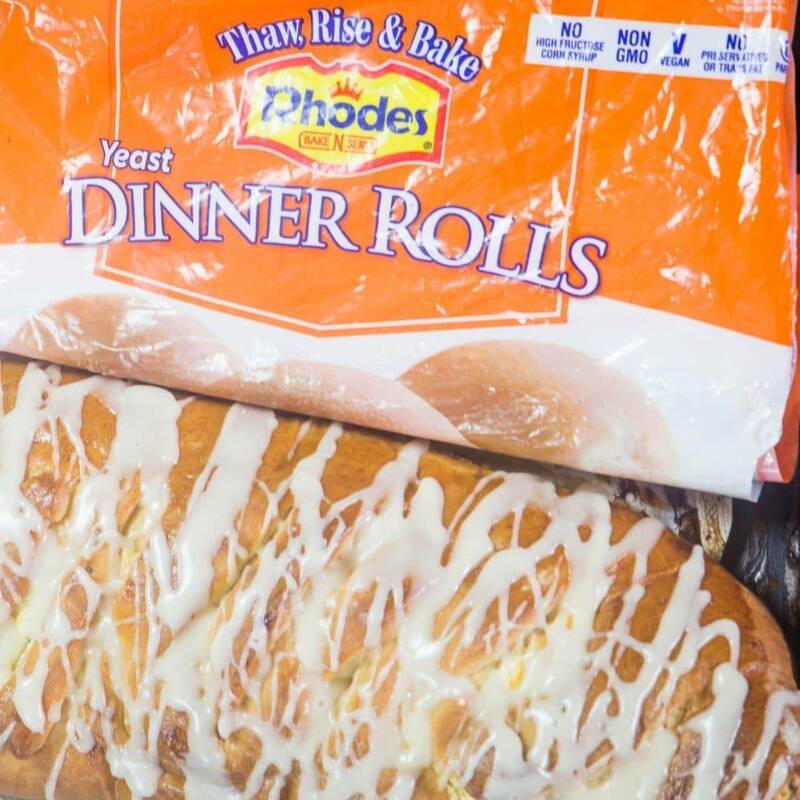 I highly suggest starting with pre-made yeast bread because it save you a lot of time and in particular, Rhodes Bake-N-Serv® taste delicious! Just like homemade yeast dough! Can you make the Cream Cheese Danish ahead of time? Absolutely! Make it a day ahead and keepin the fridge until ready to use. Can fresh berries or other jam be used as a filling for Cream Cheese Danish? You bet! Use fresh raspberries in the filling. If you prefer another fruit, knock yourself out and go for it! Any fruit works great We make it with lemon marmalade and wow was it good! How long can Cream Cheese Danish be kept after baking? The danish keeps well in the fridge for about 3-4 days.Wrap well with plastic wrap. How do you make Cream Cheese Danish? Place the rolls on a floured surface together. Pinch the rolls together. Let rest covered with plastic wrap for about 15 minutes. Form the dough into a 12 by 16 inch rectangle. Cut 2 inch strips along long sides of rectangle. Spread raspberry jam and fresh raspberries down center of dough. Spread cream cheese mixture down center of dough. Fold the top and bottom strip under dough to close bread. I love any comments or questions, please feel free to leave them below! Love this recipe, it would be awesome if you give it a 5-star rating and share comments below! 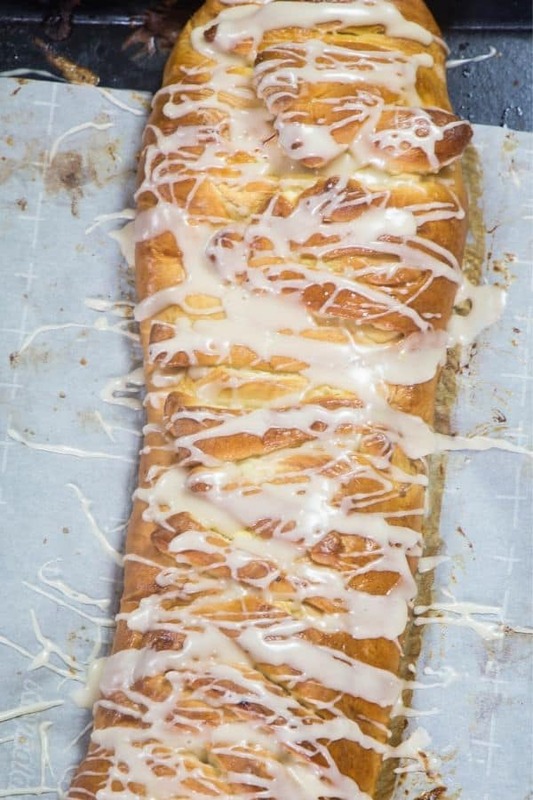 Cream Cheese Danish is a delicious sweet bread filled with a delicious cream cheese filling.Using ready made rolls as the base of this sweet treat makes this an easy dessert! Perfect for Easter, Mothers Day, etc. Pinch the dough together and form a rectangle about 12 by 18 inches.Let rest 15 minutes. In a bowl, whip cream cheese, white sugar, vanilla extract, and egg together. Set aside. Cut strips into the long end of dough about 2 inches apart. They will fold over the top to form a braid. Spread jam down center of dough, cover with fresh raspberries. Make an egg wash using just egg whites. Brush on dough. Bake 30 minutes. Let bread cool 15 minutes. Sprinkle icing over bread. In a bowl combine confectioners sugar, milk, and vanilla extract till smooth.